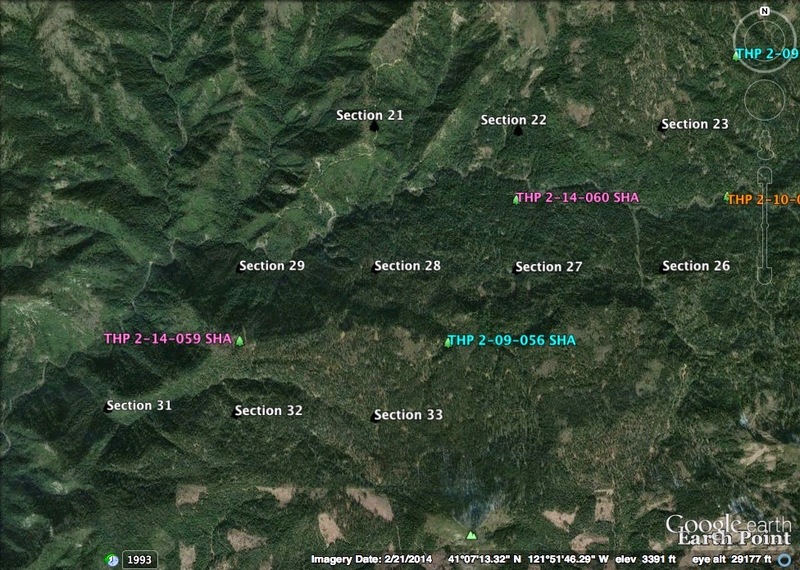 THPBlog: Hearst Corporation planning a pair of THPs SE of McCloud, CA. Hearst Corporation planning a pair of THPs SE of McCloud, CA. This THP is about 15 miles SE of a McCloud, CA and Highway 89 at an elevation of 3,600 to 4,400 feet. Hearst Corporation is planning a tractor and cable logging operation in Douglas fir, white fir, ponderosa pine, sugar pine and incense cedar stands. The THP area flows into the Pit River above Lake Shasta. There are 6 unstable areas including 2 sites containing a debris torrent near a road in section 32, a debris slide near a skid road, and 3 areas of instability along the K Line Road. The area within 150 feet of Rough and Ready Creek is designated as a late seral management area where large trees will be protected. Hearst Corporation wants to construct a road on steep slopes over 65% grade, use 2 segments of road near the Rough and Ready Creek and a class II (mid sized stream) watercourse, and use a landing inside a class III (intermittent) watercourse. Seven road drainage sites are planned for work including rocking, dip construction and culvert repair and replacement. This THP is adjacent to Hearst Corporation’s THP 2-14-060 SHA (Down and Out PTHP). This THP is about 18 miles SE of McCloud, CA and Highway 89 at an elevation of 2,960 to 3,920 feet. Hearst Corporation is planning a tractor and cable logging operation in Douglas fir, white fir, ponderosa pine, sugar pine and incense cedar stands. The THP area flows into the Pit River above Lake Shasta. There are numerous landslide terrain features mostly related to watercourse areas and steep inner gorges. A road near Kosk Creek will be re-constructed that contains some old failed crossings near some unstable areas (debris flows, road bed slumping, washed out crossings, etc). The area within 200 feet of Kosk Creek, and within 150 feet of Boulder Creek and Red Mountain Creek is designated as a late seral management area where large trees will be protected. 36 road drainage sites are planned for work including rocking, dip construction, culvert repair/replacement and road bed stabilization. There are 2 historic (1996/1998) spotted owl nesting territories in the area, and English peak greenbriar was found throughout the THP area. This THP is adjacent to Hearst Corporation’s THP 2-14-059 SHA (Little Devil PTHP). More information is available on the THP Tracking Center website.